Your current clients carry a computer in their hand. Within one second they can google the answer to anything they want. You might be confirming your in-person meetings with a potential client via text. Maybe you received an inquiry via Facebook message. Or, you may have spoken with them via telephone. Probably, you received an email. Getting the client to actually book with us, often leaves us clamoring to get their attention in any way possible. So you spend a few weeks popping into their lives in as many ways as possible. You’re trying to stay on the top of their minds. You want that call or meeting! You want the booking! So you put forth effort to look professional, reliable, concise, and available. And then you book the client! Hooray! Sadly, we often believe that getting the client is the hard part. But winning the affection of the client through to their referral is really the goal here. Do you have a plan? Have you created something that continues to delight the customer that’s is as professional, reliable, concise, and available as the last few weeks have been? Likely no, and you’re not alone! 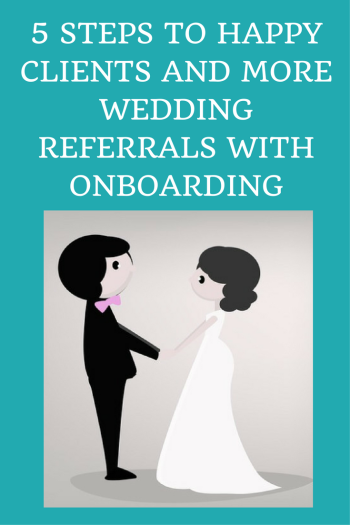 Onboarding is a semi new concept in the wedding industry. If you’re paying attention, you’ve likely heard the buzz about how to best create an onboarding process for your new clients. You’ve completed the contract and the client’s money is in the bank. Now it’s time to set the expectations for what your relationship with the client will look like. But, let’s talk about why your current email isn’t going to continue to be enough for your current and potential clients. I know, it would be awesome if they could, right? But they don’t. They don’t know all of the policies and procedures you’ve put in place in your business. Nor do they know if they’ve crossed the line until well…they’ve crossed the line. Your confirmation email might set up the next step but does it tell them the next 10 steps? Does it answer the questions they have mid-process? You know, those same questions every single client has. That same confirmation email likely leads to more emails, or texts, or Facebook messages. You didn’t make the processes of working with this client any faster or more efficient for yourself. So, let’s talk about creating a step in your client experience process that includes onboarding. One of the easiest ways to manage the expectations of the modern client is through communication. Communicating the policies and procedures of your business at the onset of the relationship creates an open air line of expectations and boundaries. It also allows you to make the client feel cared for and aware of what will be happening throughout the client relationship. In order to do this well, you’ll need to develop the policies, procedures, and boundaries you’re going set in your business. These typically include areas like business hours, communication options, response times, payment structures and platforms, Vacation Days, Holidays, and anything that is standard operating procedure for your business. Your current client’s mindset shift puts them wanting to be in driver seat more often. They are looking for wedding day collaborators! Therefore, you’re likely going to need to create a system for collaborating with your client. They want to send you inspirational images! They want to ask or get an answer to a question as quickly as they can google it. That’s why setting up a collaboration tool and employing it at the time of onboarding is going to be crucial to meeting the ever-growing expectations of your modern client. After you’ve been in business a bit you know there’s a little bit of bull in the saying “Every wedding is unique!” Because they really aren’t! As the professional, you complete similar – if not the same – tasks each time you work with a new client. Creating a written process for working with clients provides them with a roadmap of what to expect from you next. It also helps eager couples to understand in what order you’ll be handling tasks and when they should be hearing from you. Use your onboarding packet to direct new clients to other helpful information. You know, like the answers to the same 10 questions every single client asks. It isn’t a surprise that the modern client wants to connect with you. We’re a hyper-connected sort these days. However, you don’t have to connect with them on all platforms. With communication standards set earlier in your onboarding process you can expound on where your clients are permitted to connect with you and the best ways to be reached. This also means that you’ve given them all the options and can without regret turn down their personal Facebook friend request. Onboarding has become a vital – if not a crucial – step in pleasing the modern couple. By beginning to develop this step in your client’s experience you’ll easily be able to identify and communicate the structures of your business in a simple and concise way. You’ll begin to see the benefits of a solid onboarding process through time savings, pleased clients, and communication structures that exceed your client’s expectations. That gets you one step closer to earning the long term referral from your clients. What onboarding practices do you use? 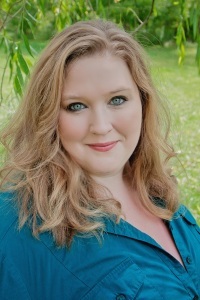 Kellie Daab, is the owner of iDo Collective and a Wedding Business Architect. 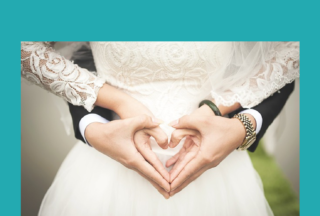 She is the creator of The Living Blueprint for Wedding Business Success, an author, and thought leader on client experience for wedding industry professionals. 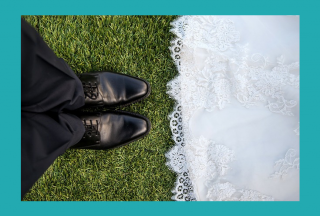 After serving 12 years in the wedding industry, owning a boutique wedding planning and consulting firm, managing high end hospitality, and producing events for a multi-million dollar catering company, Kellie uses her skills to help other wedding professionals identify what’s not working in their business and works together with them to help fix it. Paper products are her obsession and coffee is her spirit animal. 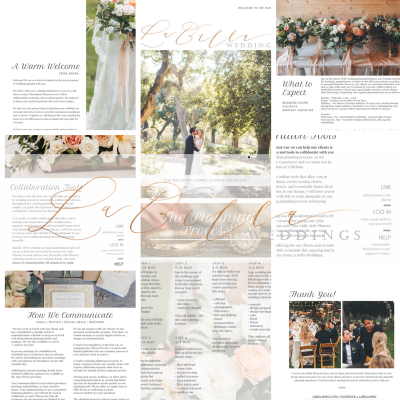 Grab the guide for creating your very own onboarding packet and join the Wedding Industry Opportunities and Collaboration Facebook group here. Thank you for this! You made me stop and think what we are doing and what we can do better. I have developed a Welcome to the Family brochure which will be sent out to each couple 5 days after signing the contract. I also found that my CMS (Honeybook) allows me to develop very detailed workflow with a lot of automation and templates so now I send emails at set times in the planning process to remind couples of what I need from them or the next step they can take.